Reenacting the persona of Abraham Lincoln has made a difference in Ron Carley's life. When he first donned the 16th President’s trademark attire – stovepipe hat, black suit, and bowtie that hearken back to the 1860s – for Halloween in 2012, it was supposed to be a one-time thing. And he has -- learning more about the man and the history in the process. Carley has appeared as Lincoln at the Henry Ford Museum in Dearborn, where the actual chair Lincoln sat in when he was assassinated is on display behind glass. Carley reenacted the Gettysburg Address on Veterans Day for Ford Motor Co. in Dearborn. He’s also spoken in classrooms, participated in parades, cosplayed as Lincoln at various comic-cons, and traveled to Springfield, IL and Gettysburg, PA. 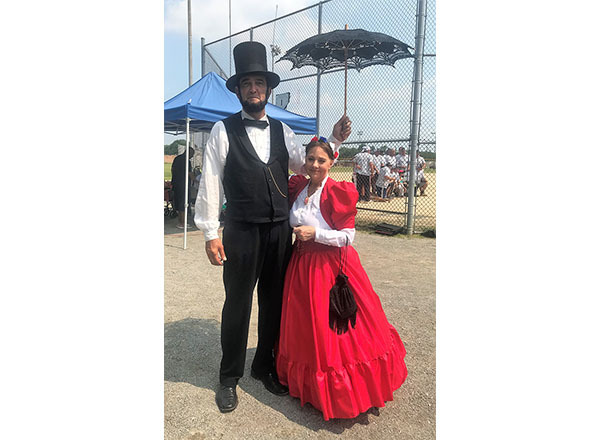 In July, he threw out the first pitch – dressed in 19th-century period clothing in 90-degree heat, no less! – at the Celebrity Softball Tournament in Ferndale, where local celebrities play to raise money for the Boys and Girls Clubs of Oakland and Macomb Counties. He and his wife, Tina, who dressed up as Lincoln’s wife, Mary Todd, posed for photos with WDIV Local 4’s Jason Carr, boxing legend Tommy “The Hitman” Hearns, radio personality Big Al Muskavito, and Macomb County Executive Mark Hackell. 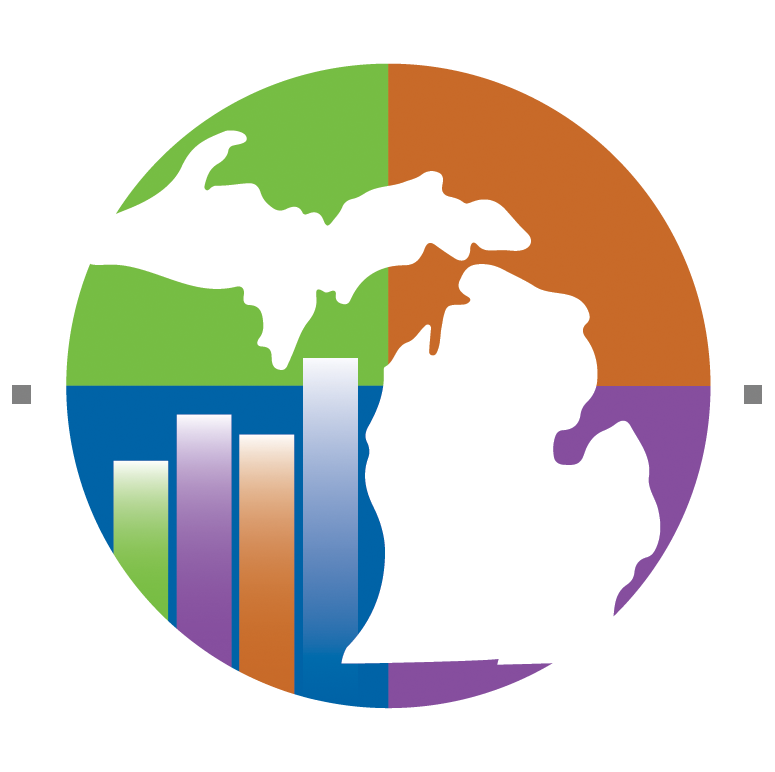 Wednesday, Nov. 14, from 11:00 a.m. to noon in Room K-14 in the basement of the Reuther Liberal Arts Building (Bldg. K) on the main campus. The event is free and open to the public. 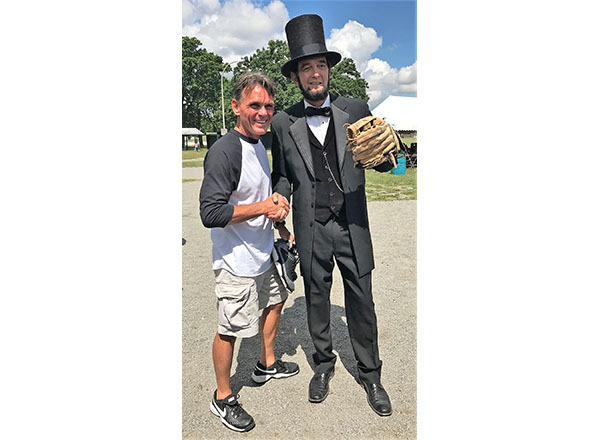 “It is amazing what Abraham Lincoln did and from where he came,” said Carley, who will detail Lincoln’s triumphs and tragedies, appearing in character as the Great Emancipator. HFC history instructor Sam Plaza invited Carley for the past two years to speak at the College. Plaza met Carley and his wife during the Civil War Remembrance Days in 2017 at Greenfield Village in Dearborn. The couple was dressed as the 16th President and First Lady, walking the grounds. Carley has extensively studied Lincoln, educating himself on every aspect of his life. Abraham Lincoln was born in one-room log cabin in Kentucky on Feb. 12, 1809. He came from a little-educated family of scant means. Yet he managed to rise to great heights, becoming the 16th President of the United States. Lincoln had almost no formal education. He even dropped out of grade school. His father, Thomas Lincoln, wanted his son to become a farmer and frontiersman like himself. Lincoln disliked the hardscrabble frontier life, despite being strong, athletic, and extraordinarily tall for his time, at 6 foot 4. Lincoln's lack of passion for frontier life strained relations between him and his father. Mostly self-taught, Lincoln was an avid reader, having read and reread – most notably – the Bible, the complete works of William Shakespeare, and Aesop’s Fables. A self-educated lawyer, he earned his law license in 1839 and went into private practice in Springfield, IL. At age 23, Lincoln bought a general store in New Salem, IL in 1832. The business wasn’t successful, and he went bankrupt. It took him years to pay off his debts. He lost his first love, Ann Rutledge, when she died of typhoid fever in 1835. Afterward, he suffered a nervous breakdown. Lincoln suffered from depressive tendencies for most of his life. His political career got off to a slow start. He ran for the U.S. Senate and lost twice. He also ran for the U.S. House of Representatives and lost twice, before finally getting elected in 1846. In 1842, Lincoln married Mary Todd. Together, they had four sons: Robert, Edward, Willie, and Tad. Tragedy was never far from the family, as Edward died when he was 3, and Willie died when he was 11. In 1860, Lincoln was elected president of the U.S. by less than 40 percent of the popular vote. He gave his inaugural address knowing that Army sharpshooters were guarding him from possible Confederate sympathizers. He was constantly under fire by Republicans – his own party – and Democrats alike while in office, and was despised by half the nation. Plaza says this made him a very divisive leader. Lincoln’s presidency further polarized the American South on the issue of slavery and states’ rights. Many southern states seceded from the Union in the wake of his election, leading to the beginning of the Civil War, which killed more Americans than any other war in history. Still, Lincoln worked tirelessly to pass the 13th Amendment to the U.S. Constitution, which formally outlawed slavery and helped lead to the end of the war. The Confederate surrender did not end the bloodshed. On April 14, 1865, Lincoln was fatally shot by John Wilkes Booth at Ford's Theatre in Washington, DC. Yet despite all Lincoln’s shortcomings and all of his failures, countless people have been inspired by him. To this day, Lincoln is considered by scholars, historians, and the public to be one of the greatest presidents the nation has ever known. With the exception of Jesus Christ, it's possible that no other historical figure has been written about as much as Lincoln. He is the subject of more than 18,000 books and counting. The Lincoln Memorial and Mount Rushmore pay tribute to him in granite. Lincoln has been portrayed by numerous actors in popular culture, including Dennis Weaver (Gunsmoke) in The Great Man’s Whiskers, Oscar winner Gregory Peck (To Kill a Mockingbird) in The Blue and the Gray, Emmy winner/Oscar nominee Hal Holbrook (All the President’s Men) in 1976’s Lincoln and North and South, Oscar nominee Sam Waterson (Law & Order) in 1988’s Lincoln and The Civil War, and Oscar winner Daniel Day-Lewis (There Will Be Blood) in 2012’s Lincoln. Join us to see the 2018 version of Abraham Lincoln live on campus November 14, 2018! The event is free and open to the public. 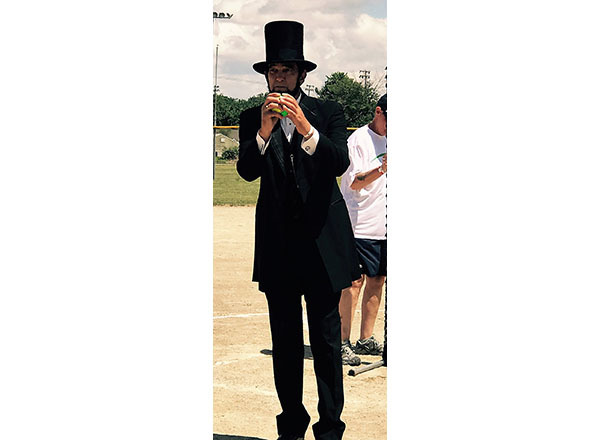 Abraham Lincoln (Ron Carley) throws the first pitch at the Celebrity Softball Tourney in Ferndale this past July. 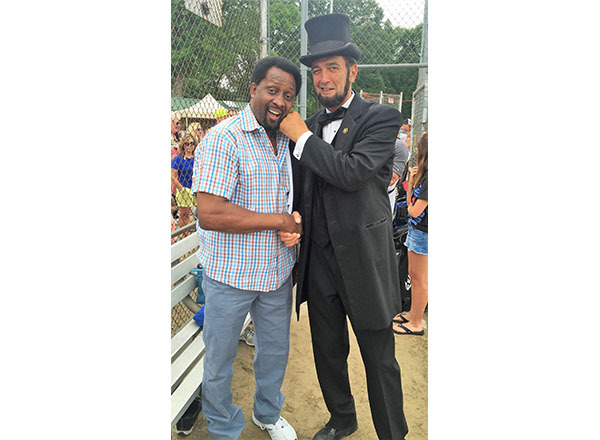 Boxing legend Tommy "The Hitman" Hearns (right) and Abraham Lincoln (Ron Carley). 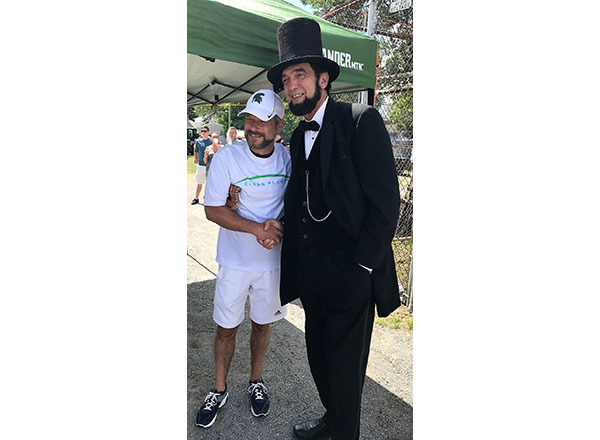 Macomb County Executive Mark Hackell (right) and Abraham Lincoln (Ron Carley). 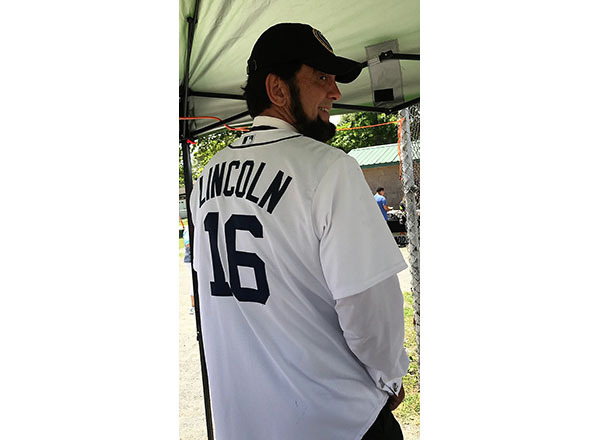 Abraham Lincoln presenter Ron Carley shows off his baseball jersey. 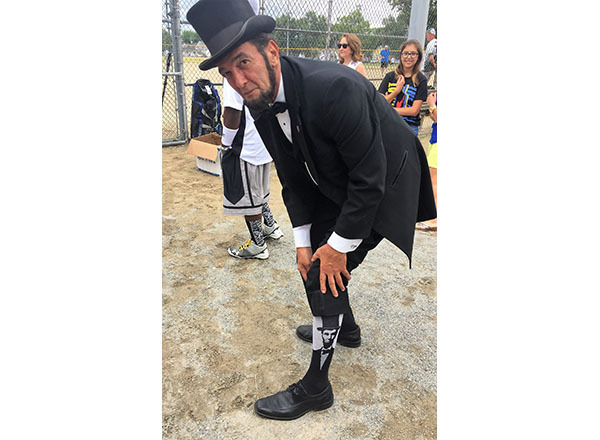 Abraham Lincoln presenter Ron Carley shows off his Lincoln socks. Local 4's Jason Carr (left) and Abraham Lincoln (Ron Carley).